I did not close position in March and there were no other trade. So Q1 was flat. 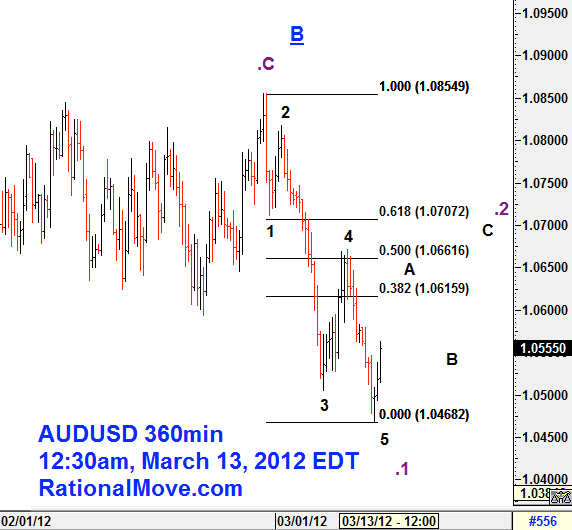 I initiated the AUDUSD short position on March 29 along with my mid term view explained in the previous post. I’d like to think .1 a leading diagonal wave. If I am correct, I will have a .2 correction before speeding the downfall to .3. I haven’t made a bet this year mostly because of a personal reason (starting out with a new job in a new city). I need to see what trading cycle I am most confortable with the new life. As the end of Q1 is approaching, I started to feel that I wanted to trade at least once. 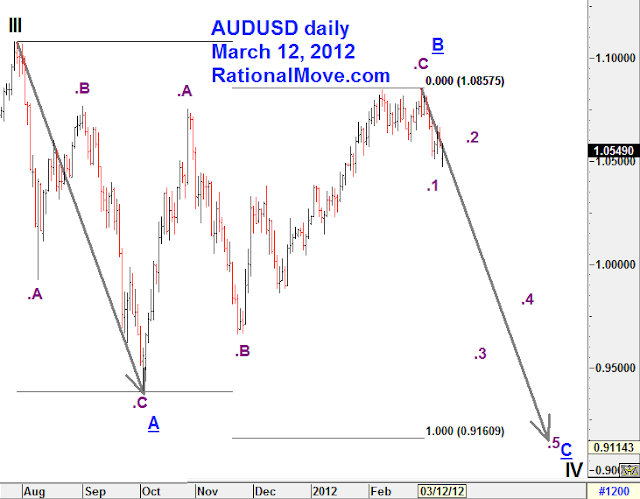 I only looked EURUSD and AUDUSD, and I decided to take on AUDUSD this time. 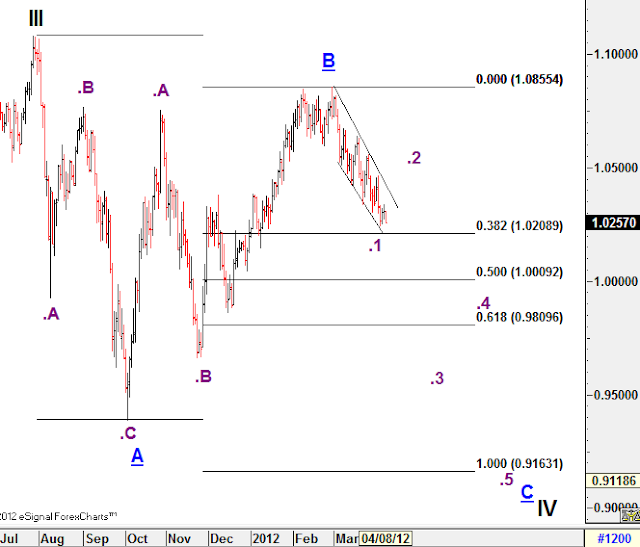 I don’t think Wave IV has ended yet, and here is the daily chart from today. 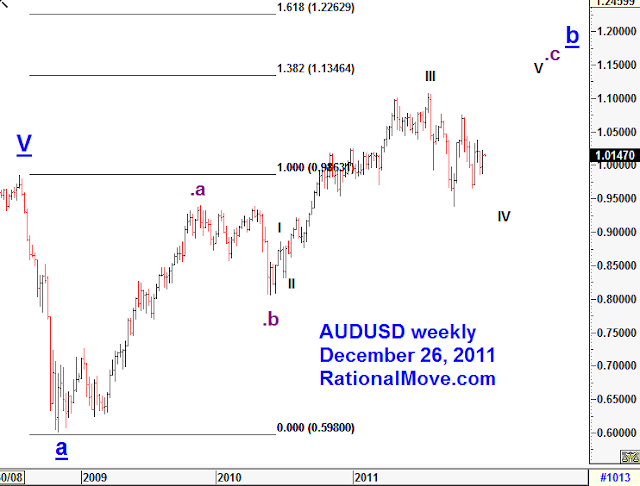 If IV is composed with A-B-C flat wave, what should be coming is downward C. So I would play short for the coming months. This year, I am thankful that I finished with a +3.09% capital gain. It is much smaller than 2009 and 2010, and I only traded 10 times in a year. By now, I know very well about my trading style and cycle. I don’t day-trade. I don’t hold too long to the carry-trade. I only take the position when I anticipate to book the profit (or at least know where the result is heading) within a week or so. 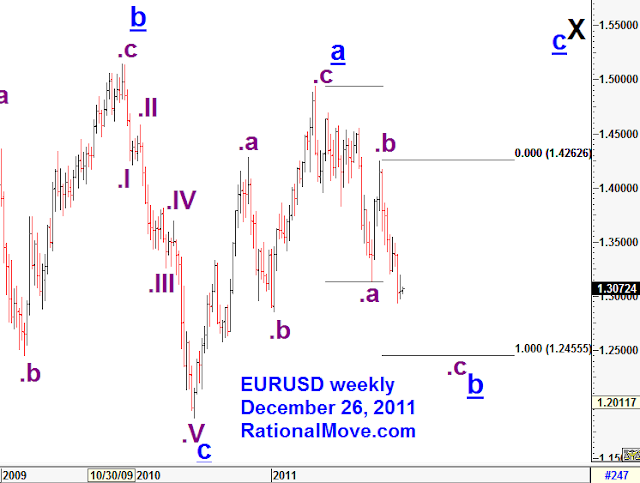 This year’s market overall especially in the major cross-currencies (*) was not giving me much opportunities. But it’s OK to me because I am not a full-time trader, and I am not convinced to change my style until the risk for such change, including the effect to my personal life style, can be measured somehow. But again, I did not lose money by rushing to take position. That is what matters a lot. Thanks for reading my blog, and hopefully next year will be the busier one in terms of trading and posting. I wish all of you a good luck in 2012! * I stopped trading metals after the regulation horizon got unclear for non-institutional traders.